These tasty and simple fritters are the perfect mid-week dinner idea when you’re stuck for what to cook. Try adding other veggies for a healthy meat-free Monday meal! 1 Place flour and Stock Powder in a large mixing bowl and make a well in the centre. 2 Using a fork mix in eggs and milk. Add corn and chives, stir well until combined. 3 Heat a little oil in a non-stick frying pan and drop ¼ cup of fritter mixture into the pan. Cook for 1-2 minutes each side until golden and cooked through. Repeat with remaining mixture. 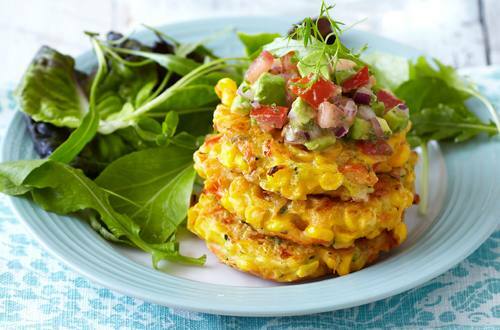 4 Combine salsa ingredients and serve with warm fritters and salad.